The axe on the left is the author's and has had 10 years of solid use. 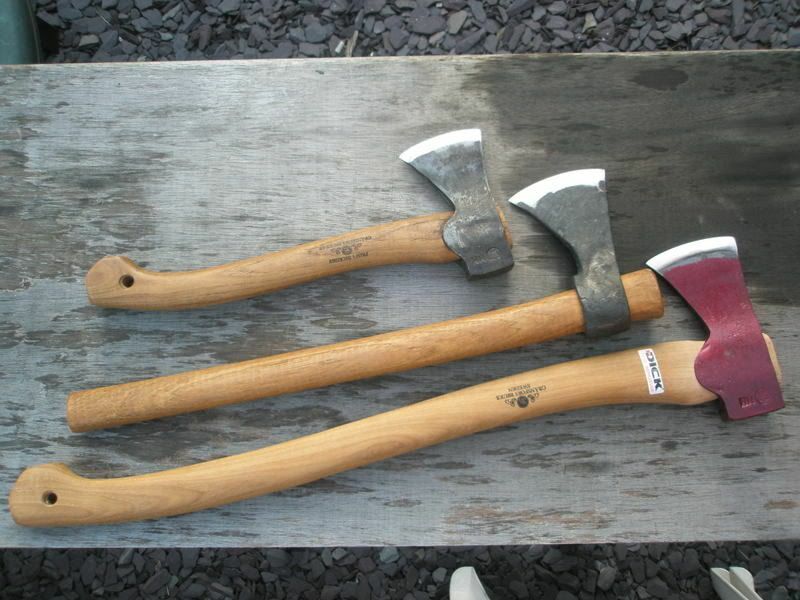 The axe on the right is the same model - a Gransfors Bruks Small Forest Axe - but only a year old. The difference is down to care and maintenance. Photo: Paul Kirtley. Many people spend more on a good quality bushcraft or survival knife than they do on an axe. In an environment where an axe is important it is often as valuable as, if not more valuable than, a knife. For example, in the northern, or boreal, forest where trees grow slowly and the wood is dense and knotty, an axe is extremely valuable and your most important tool. In any woodland where you were working on larger woodcraft projects that require bigger sections of wood, being able to fell and process both live and dead standing trees is something for which you need an axe. 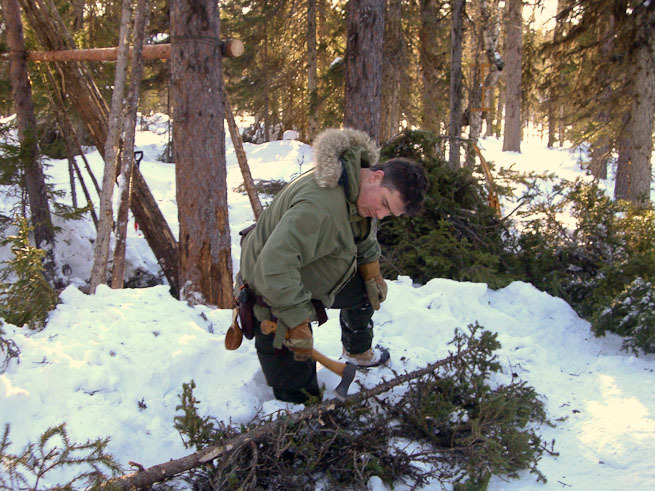 Larger woodcraft projects such as making camp furniture often require the use of an axe. Photo: Paul Kirtley. A good axe of a traditional design has several components made of materials which require some maintenance. If you look after your axe, it will give you many years of service. A good quality traditional-style axe will likely have a wooden handle, or 'helve' as it is sometimes known. As with any wood that is kept or used outdoors, it needs to have some protection from the elements, most notably water. When you buy a new axe it comes with a protective finish on the handle. This finish is often made from linseed oil and beeswax. A good axe will have a head made from high quality steel. The head will be tempered so that the bit of the axe is tough, not easily chipped and able to attain a very sharp yet resilient edge. This quality piece of steel will also need some protection and care to keep it in prime condition. The third component that we need to give some consideration is the mask. This is what some people might call the sheath but is more appropriately called a mask. A mask on a traditional-style axe typically will be made of leather. As with any leather item, it will need protecting from the environment to keep the leather in good condition. Keeping your axe in prime working condition does, of course, include keeping it sharp. I'm not, however, going to cover axe sharpening in this article. What we're concerned with here is how to keep your axe in good condition and protected from the environment. 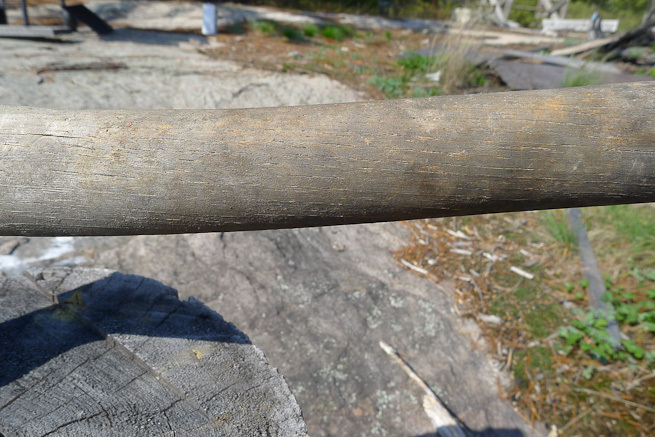 The axe head of a good quality axe such as those made by Gransfors Bruks is typically made of steel that is not stainless. That is, it will quite easily rust if allowed to remain damp for a period of time. This would obviously have a detrimental effect on both the finish and ultimately the longevity of the axe head. So, we must protect against moisture. Most axe heads will rust if not protected from moisture. Photo: Paul Kirtley. The easiest way to do this is to oil the axe head. Some oils are better for this than others. But in the absence of the ideal, anything is better than nothing. Personally I find a gun oil which is designed to dry once applied is the best option. It remains on the axe for longer. Also, since it dries it doesn't make the inside of the mask oily. Nor does it transfer on to other items of kit while packed in a rucksack. First remove the mask then apply a thin layer of oil all over the metal of the axe head. Remove any excess with a cloth. Leave the oil to dry before refitting the mask. If there is some rust already present, apply some oil and use some wire wool to remove the rust and work oil into the area. Wipe the area clean then apply oil to the whole axe head as above. The handle of a traditional-style axe will typically be made of wood; these days this will most likely be of good-quality hickory. Hickory is a very tough and resilient wood but will still last much longer with a protective finish. This hickory axe handle has been exposed to the elements for an extended period of time and the factory finish has all but gone. Photo: Paul Kirtley. We want to retain, if not improve, the finish that the axe handle comes with. While we can completely replace the factory finish on a wooden handle and replace it with a higher-quality finish such as traditionally used on gun stocks, this is not necessary for keeping the handle in good condition. 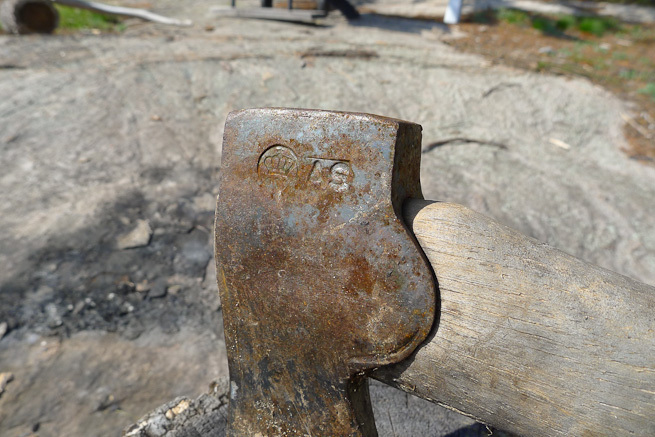 With axes such as those by Gransfors, maintaining the finish of the handle is a case of simply applying a coat of boiled linseed oil from time to time. Please note that it must be boiled linseed oil, not raw linseed oil. Raw linseed oil will not dry; at best it will remain sticky. Boiled linseed oil can be bought from DIY/home improvement stores quite readily. First make sure the handle is free of dirt then simply apply the boiled linseed oil to the existing finish. To do this take a rag, pour on some of the linseed oil and rub this into the handle. Alternatively use a small paint brush to apply the liquid. Once you've coated the entire handle reasonably liberally, take a rag or some kitchen towel and remove the excess. This should now be a thin layer of linseed oil left remaining on the handle. This can then be left to dry. This simple process provides another very fine layer of finish to the handle and increases its level of protection from the elements. Over time if you keep adding single layers, you will build up a very good and resilient layer of finish on your axe handle. Warning: Please note that rags or pieces of cloth soaked in linseed oil can spontaneously combust if left scrunched up and should not be left indoors. The potential for serious fire is well-documented. The best solution - where safe to do so - is to burn the rags. The second-best solution is to leave them hanging outside, unfolded to dry before disposing of them. If you have a mask that is made of leather it will need to be cared for. You must remember that the mask is designed to protect you and your other equipment from the sharp edge of the axe bit. The mask must retain its original good fit. You do not want the mask to become loose or to fit sloppily. Therefore, you shouldn't apply any treatment that will soften or allow the leather to stretch beyond its original size and shape. There are a number of easily available products that can be used to treat your axe mask. Personally I use Nikwax Aqueous Wax. To apply this treatment to the axe mask, first remove the mask from the axe. Then apply a liberal amount of the liquid to the exterior of the leather, not forgetting the welt. Leave the Nikwax to dry, then rub it into the leather with a damp piece of kitchen towel or cloth. This last action creates an even protective finish. If you follow the above simple steps to look after your axe and apply them on a regular basis, your axe will stay in top condition for many years to come. In the boreal forest, an axe is your most valuable tool and is best kept in top condition. Photo: Stuart Wittke. I hope you find this information useful. Please let me know in the comments. Also, please let me know in the comments if you have any other axe care tips. Excellent advice as always. Cheers paul. That Mr Mears bloke once said, Bushcraft is about looking beyond the obvious and seeing the possibilities. Given the popularity of things like the gransfors small forest axe, there is a real propensity for mix ups at large gatherings of Bushcraft minded folk. Like at the BushcraftUK bushmoot. In order to overcome this, and being an urban bushman, I go foraging along the bathroom windowsill. Here you can often find axe maintenance materials growing naturally. These materials include cotton swabs, nail varnish remover, and bottles of nail varnish (select manly colours only). Use the nail varnish remover and cotton swabs to clean sap and oil off your axe head. Then paint the head with nail varnish. All my personal Gransfors are done in a manly burgundy nail varnish. This not only protects the head, but means that my tools are instantly recognisable, even from a distance when some chuckle-brother neophyte numpty has decided to help themselves to it. 🙂 Good tips indeed. That’s definitely a novel approach and one that I’m sure works in differentiating your axes from those of other mooters. I can’t recall ever having seen an axe-head painted this way. oh, and oiling the helve. ikea chopping board oil works a treat too. Good extra tip. I’ve not tried it. What’s in the oil? a very good article. Now I realise that an axe is kind of just like a knife in the aspects of caring for it apart from the bigger handle made of a different material if the knife handle is plastic. Also, in the last photo, what are the glove that he’s wearing? i’m looking for a pair that are warm and still look natural and have a good grip. The gloves I’m wearing in the photo are Hestra Falt Guide Gloves. If you have any questions, just get in touch. That’s very true Jomo – best to choose your axe right in the first place if you intend to make it last a lifetime. It seems the alignment of the grain is not as critical with hickory as with some other woods such as ash. What type did you manage to break? Thanks also for the heads-up on the USFS video. ikea chopping board oil is a basic mineral oil. A bushcraft instructor ones told me to sand the axe handle with 150 grind sand paper. Then work it with 400 or 600 and repeat the process 3 – 4 times. Finaly a treat with linseed or warm olive oil gives a smooth and very good looking handle. And reduces blisters too. Could you explain further on re finish. Would like to get it right. You tube video or blog. Keep up the goid work. Thanks John. Yes, that’s a good idea. I’ll add it to my to-do list of blogs/videos. Great advice on getting & keeping your Axe in tip top condition ! How are you getting along with your Wetterlings? Glad you liked the article. In my view, you’ve got to look after your tools. And if you really value them, you will. the old wives tale about keeping axes indoors, drying out the handles so they start checking and the heads come loose. it really does happen. i’ve ruined a couple of helves this way. Great article, thanks. Not sure if they sell it in the UK, but I’ve found Boeshield T9 to be superior to gun oil. It is a paraffin-based lubricant used to prevent carbon steel marine equipment from rusting in salt-water environments. Excellent stuff. Thanks for your comment – good tip! I wasn’t aware of Boeshield T9 but I’ve searched and it seems it is available in the UK, particularly through bike shops. I’ll be looking out for some to try. Thanks for your comment and for sharing this article with your friends. It’s good to know that people are finding it useful. Which model Wetterlings axe did you buy? A bit late… I own the #118, sold here as the Bushcraft Axe. It is what the Small Forest Axe is at Gransfors. As a new owner of a Gransfors splitting maul I was to eager to use it and split some wood that was probably to wet and now I have tree sap on the handle. Any suggestions on how to remove this ? Thanks for your comment. It’s good to hear you enjoyed my article. The splitting mauls are great. It’s incredible what they will cleave like a knife through butter. As for removing sap, I would try dabbing it with a bit of turps on a rag. Charlie, alcohol hand cleansing gel is fantastic at removing pine sap. Thanks for clearing up a few questions with this great article. I recently bought a Wetterlings axe. Great axe but the handle does not appear to be treated. So, now I know how to care for my axe… Thanks. So, how about something about the anorak tou’re wearing in your photo. That’s the thing I’m interested in. I like your articles a lot..
Another very interesting and well written article. I do love my axes and I’m sure this will keep me focussed on good care. Not sure about the nail varnish but it does make the axe stand out. Will it catch on? Do you think that the factory grind on a eg Gransfors Small Forest is the optimum for ‘general purpose’ use? As always it’s good to hear from you. Thanks for your comment on this article. I always use oil and that, for me is the most important regular maintenance to stop the axe from deteriorating significantly in any given period of time. I think nail varnish is probably better in general for axes which are used relatively infrequently and to keep them in good condition in between uses. As for whether it will catch on, I think it depends on the colour of the nail varnish…. I’m pretty happy with an off-the-shelf Gransfors Bruk SFA in terms of the bevel/edge. The finish on the handle bothers me a LOT more. I’m sure they used to be better…. That’s nothing a bit of re-finishing work won’t resolve though. My oldest and most used SFA is a little less fine in its edge than a new one but that’s down to wear and how I sharpen it. The steel is very good quality and will withstand chipping even with a fairly fine edge. I think I should have some axe sharpening notes/videos in the pipeline for 2014…. Very helpful article! The axe is such an essential tool in the outdoors! Thanks Scott. Yes, you’ve got to look after your important tools. Hey Zed, good to hear from you. 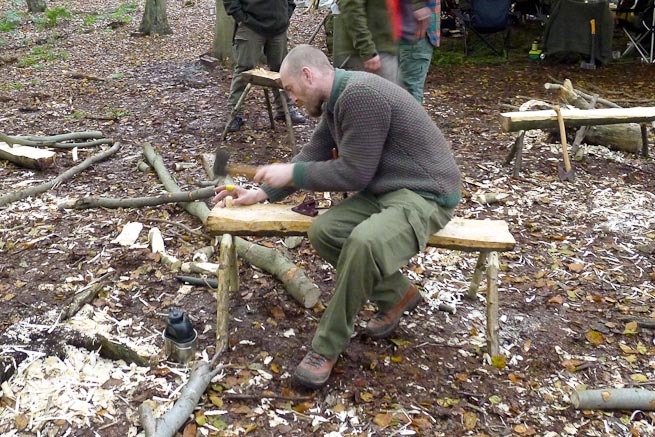 Thanks for your comment – it’s good to know that this will help you with your bushcraft journey. great article, good advice thanks for sharing …. Wasn’t aware how flammable linseed oil was, when scrunched up on a rag, will take onboard. Good piece Paul, thanks. Gotta ask; was the axe on the right found next to the sun bleached bones of a fallen brother woodsman? Just kidding! I use Ikea worktop oil on the handle of mine and 3 in 1 on the head. The worktop oil doesnt bring the finish out as well but it does the job. Coincidentally my GFB was made by ‘AS’ as well. Good grief! 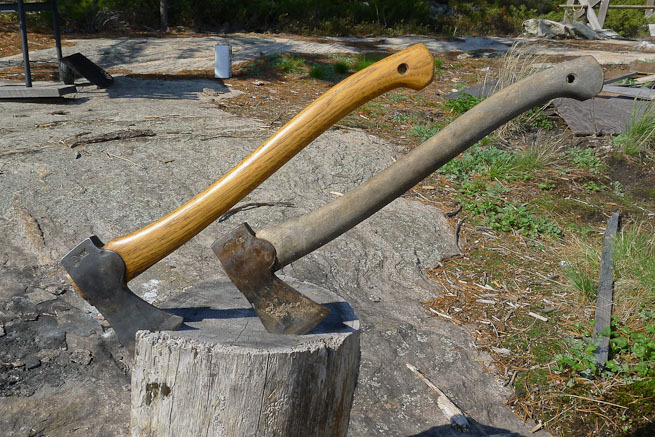 Was the axe on the right found next to the bleached bones of a fallen brother Woodsman? Just joshing! I use Ikea worktop oil on the handle of mine and 3 in 1 on the head. Like the idea of using an oil that dries though. Coincidentally my GFB was made by AS as well. I’ve seen videos of people using boiled linseed oil to soak into the top of the handle of their GB axes so as to make the axe handle “swell” at the top, thus making the handle-to-head fit even tighter, and hopefully keep it from working loose sooner. But they were concerned about the linseed oil running onto the handle, so they wrapped tape around the top of the wood sticking out thru the top of the head. My thoughts: If the boiled linseed oil is both good for wood, and also metal, shouldn’t it be okay to just “soak” the entire head in a bucket of boiled linseed oil to treat the axe? After a good soak, you could then rub the oil on the helve and wipe it off the entire axe. What are your thoughts? Thanks so in advance for your help and advice! – Charlie B.
I don’t think this is accurate. Linseed oil has been used for ages without any drying agents on wood. It does take a whole lot longer to dry, though. It will only get gummy and sticky, if the excess is not wiped off, but the same holds true for boiled linseed oil. Hi David, it is accurate within the timeframe most active people are willing for their tools to be out of action. Waiting 1-2 weeks for one single coat of raw linseed oil to dry is not acceptable. Moreover, for building up layers of hard finish with linseed oil, then boiled linseed oil is necessary. The refinishing I do on axes requires a coat per day for over a week. You simply cannot do this with raw linseed oil. Further, it is generally accepted that boiled linseed oil is better for durability on tool handles as it tends to provide a harder finish. I like most of your ideas, they cover the basics well but there are a few things I want to point out for other readers that may have the same concerns about products they use for equipment. 1.) “boiled” linseed oil isn’t actually boiled it has a chemical dryer in it known to be carcinogenic and shouldn’t be handled without gloves, for those who don’t know carcinogens DON’T leave the body but build up like heavy metals or aluminum/lead so in my view that is not something i want on equipment that i will be handling with my hands, dry or not those chemicals are there and I’m not comfortable with that. 2.) Mineral oil is a petroleum based product and equally not adequate for use, no petroleum based product is safe no matter what the label tells you. The industry as a whole needs safe natural products that will preform as well as the old standards and research into that by all the millions within the community should come up with something,right? just my two cents for what its worth. I just bought a Council Tool “Woodcraft” camp axe with a 17″ handle. Love this small axe for splitting and camp chores. Great for car camping, canoeing and horse packing. Perhaps these are not the traditional substances used on axe heads and handles but in my experience they work very well.